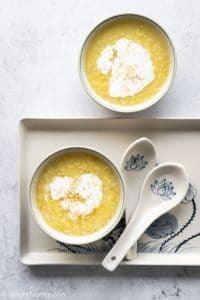 Vietnamese Mung Bean Pudding is one of the classic Northern sweet dessert soups. This healthy and tasty dessert has the right amount of sweetness and richness. The best part is you can make it with a pressure cooker in 15-20 minutes. What is Vietnamese Sweet Soup (Chè)? Sweet soup (called chè in Vietnamese) is the most popular form of desserts in Vietnam. 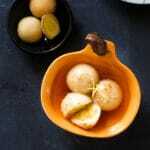 This highly customizable dessert can contain a wide range of ingredients, such as beans, root veggies and fruits, cooked in water until soft, sweetened with sugar and then sometimes thickened to likings. Some chè recipes you can find on my blog are che troi nuoc (glutinous rice balls in ginger syrup) and che chuoi (banana tapioca pudding). This mung bean pudding, or you can also call it mung bean sweet soup, is a common dish in Northern Vietnam. We call it chè đỗ xanh (mung bean means “đỗ xanh” in Vietnamese) or che hoa cau. My mom often makes it as a dessert in the family banquet for special occasions, such as new year or mid autumn festival. It is also easy to come across che do xanh at many sweet soup stalls on the streets in Northern Vietnam. Strictly speaking, Vietnamese mung bean pudding (chè đỗ xanh) only calls for split mung bean, sugar, thickener and water. My family usually eat it with steamed sticky rice, so I also add sticky rice for extra flavors and texture. 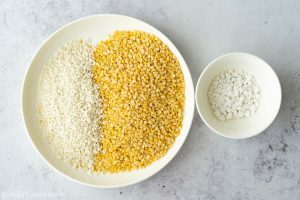 Sticky rice also acts as a natural thickener. For your information, when sticky rice is added to sweet soup, we call it xôi chè. The traditional thickening agent for chè is kudzu root (bột sắn). Kudzu root starch is white and usually in “rock” forms. In Vietnam, kudzu root starch is often infused with jasmine fragrance so when used it in chè, it gives the sweet soup a very pleasant aroma. I once saw kudzu root at my local health food store in Illinois, and I also saw it on Amazon but I guess it is not something easy to find outside of Vietnam. 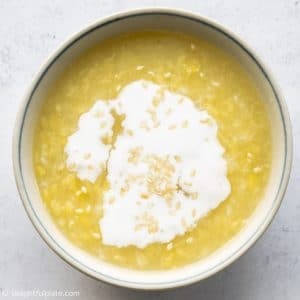 You can also use cornstarch or tapioca starch to thicken this dessert soup. Additionally, you can add a drop of vanilla extract or some pandan leaves to enhance the flavors. 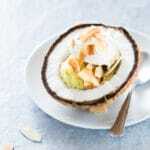 When eating it, you can drizzle some coconut milk on top for extra richness. As you can see, this mung bean sweet soup is plant-based, totally vegan, gluten-free and dairy-free. The traditional method to cook mung bean pudding is on the stovetop. However, this method requires soaking split mung bean in water for 1-2 hours. And if you want to eat it with sticky rice, you will also have to soak sticky rice for several hours before steaming. That’s why I love to make it with a pressure cooker (such as an Instant Pot). No soaking is needed and it’s ready in 15-20 minutes. All you need to do is washing the split mung bean and sticky rice, then adding them to your pressure cooker. Once ready, sweeten and thicken the mung bean pudding to your liking and serve with coconut milk if desired. It’s best to serve this dessert warm. I personally like a high ratio of bean and rice to water, but feel free to adjust with more water if you want. 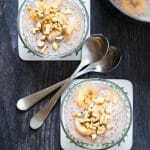 Vietnamese Mung Bean Pudding (Che Do Xanh) is one of the classic sweet dessert soups. This healthy and tasty dessert has the right amount of sweetness and richness. The best part is you can make it with a pressure cooker in 15-20 minutes. Wash split mung bean and sticky rice. Drain and add to the pressure cooker. Also add 4 1/2 cups of water and a pinch of salt. Cook on high pressure for 2 minutes. Let the pressure cooker depressurize naturally for 5-7 minutes, and then quick release the remaining pressure. Turn on Sauté mode. Mix starch with water to create the starch slurry. Slowly add it the the mung bean pudding while stirring to thicken it to your liking. Use only as much as you need, and the pudding will also continue to thicken while cooling. Stir in sugar, use more or less to your liking. Transfer the mung bean pudding to serving bowls, drizzle some coconut milk on top if desired and serve. You can scale down the recipe by half to cook a smaller batch. It will work fine. You can add some knotted pandan leaves to the pressure cooker before pressure cooking to enhance the flavors. Remove the leaves once pressure cooking is over. Alternatively, you can add a drop of vanilla extract to the sweet soup after pressure cooking is finished. Cooking time may vary very slightly depending on your specific pressure cooker. After pressure cooking is over, if you taste and find that the mung beans and sticky rice are not as soft as you want, you can cook the sweet soup for a few more minutes with Sauté mode. Or you can leave the soup in the pressure cooker with Keep Warm mode until it is soft to your liking. Then add thickener and sugar to taste. After that, transfer the pudding to either serving bowls or food containers immediately to stop the cooking process.